Company | Salmon Bay Sand & Gravel Co.
Salmon Bay Sand & Gravel Co. is a locally owned family business, serving the construction material needs of Puget Sound. Since 1907 the generational legacy of treating employees as family, customers as friends and suppliers as partners, has been the source of our longevity and success. From our original Ballard location we continue to support the tenet that “Service is our Tradition and Quality is our Foundation”. Salmon Bay Sand and Gravel Co. has been in operation for over 110 years at its original location on Shilshole Ave NW, in Ballard. This fourth-generation family-owned business has played a major role in the development of the Greater Seattle area. 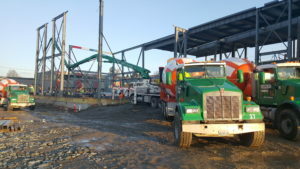 In addition to supplying sand, gravel and concrete Salmon Bay Sand and Gravel Co. has evolved into one of the Northwest’s largest suppliers of construction materials. The company specializes in plaster, stucco, EIFS systems, waterproofing, restoration products, sealants, grouts and many other construction products. SBSG is also known throughout the region for its assortment of tools and accessories used in trowel related trades. We serve customers all over Pacific Northwest, Alaska and have special projects that reach the far corners of the world. Whether it is a Craftsman-style home in Ballard, or the U.S. Embassy in Prague, Salmon Bay is proud to be a part of a variety of projects, big or small. When Samuel Nerdrum travelled from Norway to the PNW, the Ballard area of Seattle was still the City of Ballard. Cedar trees and three-masted schooners dotted the skyline, the Space Needle was unimaginable, and William Boeing had yet to build his first airplane. It was a good time to start a business in the prosperous Scandinavian logging and fishing community located on the shores of Salmon Bay. He set out to start a business and founded Salmon Bay Sand & Gravel Co. in 1907. The new company’s first major project was the 1907 Alaska Yukon Exposition. At that time, there were no Ballard Locks or ship canal (they would not open until 1917), so barge loads of sand and gravel were brought into Salmon Bay at high tide and hand loaded onto horse-drawn wagons for the trip to the exposition site. These original buildings now stand as a historic part of the University of Washington campus. Over 90 years later, and still operating at its original location, this fourth-generation family-owned business has played a major role in the development of Seattle and its northern neighborhoods. Today, a fleet of modern delivery trucks transport materials throughout the Puget Sound area, over many of the same routes their early Teamster predecessors guided loaded wagons of sand, gravel and cement. When a company can proudly lay claim to having been in business since 1907, they stand out among the competition. SBSG distinguishes itself among businesses because of decades of industry knowledge, quality products and outstanding customer service. Drivers sit proudly in their trucks, which were “chain driven” and featured “hard rubber tires”. Today’s modern Concrete Mixer Truck can carry up to 10yds of Concrete. You have probably seen the orange striped and green mixers driving to and from job sites all over Seattle! Need more information about Salmon Bay products? Need more information? No problem. Reach out to a Salmon Bay Sales Executive who is ready to help.